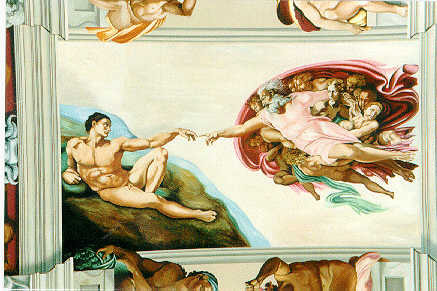 In 1987 Gary Bevans went on pilgrimage to Rome and was transfixed by the wonder of the Sistine Chapel. Indeed, he returned home convinced that he had to express his passion for this amazing building by reproducing the ceiling in his own parish church of English Martyrs in Goring. Happily his parish priest and parishioners were enthusiastic for the idea and accordingly he set about the task,working evening after evening for some five and a half years. The project was completed in 1993 and stands as an exceptional example of how, by using our gifts, we can transform our communities. Of course the use of frescoes, murals, and mosaics dates back down the centuries in many religious traditions. They formed the classic way of instructing the people about the stories which shaped their faith, and in the days when only a small percentage of the population could read they were mightily effective. And of course they are still effective today, for art and music can touch us in ways that the written word cannot. While the recent trend has been towards a certain starkness and simplicity, most of our churches are still adorned with shrines and statues and paintings as focuses of our prayer. Among them English Martyrs, Goring, is unique. For it was built as a new church to fulfil the requirements of Vatican II, and to replace the stone barn that nows serves as the parish centre. Gary Bevans has shown us how to combine the old and the new and a very dramatic way. Interestingly, the artist is by profession a designer. He explains that the greatest discipline demanded by the project was to resist the temptation to put anything of himself into the paintings. He is also able to speak of the profound effct of working for long hours alone in the presence of Blessed Sacrament had on him. Because of the many visitors today, the Blessed Sacrament is reserved in a small adjacent chapel, formerly part of the old church. The church is open throughout the year and visitors are welcome.